I bought the machine new and installed an Auber PID as per auber guide. I took a while to find the temperature I thought was most suitable to set the PID to, eventually coming to 104 degrees celsius (in the hope that this would translate to 93 at the group head). This seems to extract the espresso with the most balance, but it still comes out tasting a bit dirty. I always purge before re-attaching the portafilter; I either use a 21gram basket and put about 22grams into it, or I use a 15gram basket and put about 16.5grams into it. I weigh my doses and also weigh my espressos. The roaster suggests a 1:2 ratio for dose:extraction, so I cut of the pump to achieve an espresso of the appropriate weight ratio to my dose. I extract into a heated cup. I always pre-heat the machine for 45 mins. I buy fresh beans and store them in an airscape - never working with anything older than 10 days (10 days of being vacuum sealed!). I use a Compak K3 grinder. I tamp level, firm and with a pullman tamp that reaches the edges of the basket. I'm gentle re-attaching the porta-filter to the group head to avoid fractures in the puck. When I watch the extraction it looks ideal - a pause, few dark drops to start, progressing into a nice thin stream of viscous, dark, consistenly-coloured caramel that then gradually lightens until I cut it off at the desired weight of espresso in my cup. I clean the shower screen regularly and back flush the machine decently often (but really don't use the machine much). Any help would be greatly appreciated everyone. So frustrated!! Dying to have good home coffee again! Maybe need to post a video of the whole process. What exactly do you mean by "dirty"? I had a Silvia (only just recently upgraded) and could get fantastic espresso out of it - milk coffees were fantastic too, my only reason for upgrading was due to not being able to make back-to-back coffees fast enough. Andy, PhatBoy and Rawshack like this. Have you tried other coffee roasters ? Yeah, +1 for change roasters (disclosure - I'm a roaster!). Also.. read less, taste more. Way too much science/noise/complications in your post. Turn your temperature down, sounds way too high for shots, good temperature for the milk though. Use the Silvia double (15g). Fill to overflowing, don't tap, wipe level, tamp hard, pour, stop if it blondes, 25 seconds odd is the target, taste. If the pour is faster go finer, if the pour is slower go coarser. Description of your pour sounds spot-on. Keep it simple and you will get good espresso, fiddle with 0.0001g coffee weights and name brand baskets/showers etc after you get bored with good espresso. bosco, magnafunk, HorseFD and 2 others like this. I just got a silvia a couple of weeks ago and am starting to get decent (but far from perfect) shots. It took me a while to dial in for the right grind, and get the tamp right, but after a 1kg or so of bean I'm getting results. I think you are shooting the messenger here (i.e. Miss S). I had a non PID one for over 9 years and they can make a fine coffee with a bit of effort. Set the Miss S temp to around 95C (sheer guess, should be close enough). Preflush it. If possible use a "fast response" digital thermometer to see what the group head temp actually is immediately after the preflush. around 92C is fine. 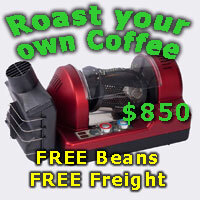 Try another fresh roast (Andy's suggestion) - why not get one of his if you are in Vic? Every state has plenty of fresh roasting places. Use filtered water (damn near essential for testing). Some WA tap waters instantly trash ground coffee upon contact. If none of that works, try a different grinder. Wouldn't be the first time I have encountered a faulty one - even if it is a good brand. If that is not possible, find a cafe which makes a good (to your tastes, anyway) coffee and tell them your issues - "extract" some of their whole beans and a small amount of their beans ground on their grinder. Seal the grinds with gladwrap / equivalent (no air spaces), race them home and make a cuppa asap (ground coffee oxidises really, really quickly). If it is still crap (unlikely) then try a different espresso machine with your beans / water / grinder to see how Miss S copes. My V3 with auber PID is set at 106. There is a fair bit of difference between where the temp is read and what the temp at the basket is. I used a 18g precision basket. Usually put about 19g into it. If you are using a pullman tamper, I'd suggest getting a pullman basket. Not really sure what you mean by dirty tasting shots? How much temperature drop do you get from start to finish of a shot (per reading of your PID)? Like Mentasm above, I use a 18g precision basket too with my Rancilio Lucy with PID, put about 19g. Agree with people above me, try different beans probably, the espresso when you taste the shots they extract using a commercial machine with their beans might not be achievable with your home machine sometimes. Maybe it's just your high taste expectation (what's dirty taste anyway?). I just upgraded from a Silvia and it had a Watlow PID fitted. I too ran it at 106 after experimenting with different temperatures.